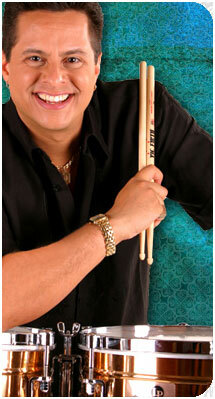 Tito Puente, Jr. has become a favorite entertainer in casinos, performing arts centers and jazz festivals nationwide. He was the premiere act opening The Latin Quarter of the Tropicana Hotel and Casino in Atlantic City, and the demand for tickets kept him there for ten weeks. He's played to sell out audiences at numerous Harrah's Resort Casinos, including Rincon in San Diego, Ak-Chin in Phoenix and the Rio in Las Vegas. Tito Jr. reveres the magnificent, lasting impact his father had on our musical lives. Audiences the world over agree there is nothing so perfect, pure or passionate than a tribute to a father from his son. "People who don't know anything about Latin music know my father and people always, always smile when they say his name," he confides. That is a very special gift, and it inspires and motivates me to bring his music to the world."